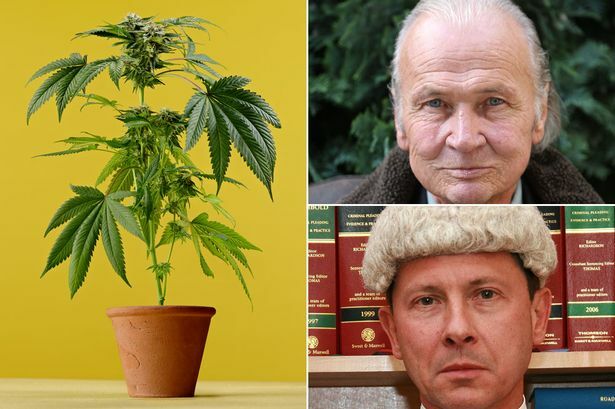 A judge today refused to jail a cancer victim who has twice been caught growing cannabis – saying he would ‘not be able to live with himself’ if he locked him up. Jonathan Yates, 65, whose throat has been badly damaged by radiation treatment for tongue cancer, says cannabis is the only effective pain killer he can find. Although he was caught cultivating the drug in 2011 he went on growing it in his home in Brockworth, Gloucester, and was arrested again in April . He pleaded guilty at Gloucester crown court today to producing 36 plants in his home and to supplying some to his lodger. But after hearing of his plight Judge William Hart refused to jail him – or even pass a suspended sentence. “You know that ordinarily a custodial sentence would be considered and might even be inevitable for this sort of offence but I would not be able to live with myself if I sent you to prison,” said the judge. The judge gave Yates, a property letting agent, a 12 months conditional discharge. But he said his decision should not be seen as a green light for others to grow cannabis with impunity. It was an exceptional sentence for a man in ‘grave circumstances,’ he said. “Yours is a wholly exceptional set of circumstances and you have my sincere sympathy for your position,” said Judge Hart. He told how he had been reacting badly to morphine for his throat pain after radiotherapy in 2011 and then tried cannabis and found it far better and without side effects. Many countries have legalised it, especially for medicinal use, and it is time the UK did the same, he said. Mr Yates has lost his sense of taste and smell and cannot eat solids because of his illness. Prosecutor Janine Wood told the court police raided Yates’ home on 9th April and found 36 cannabis plants growing in a bedroom. Itt was estimated they would have produced between £10,040 and £30,240 worth of the drug. Yates told police it was for his own use and the only other person who knew about it or used any was his lodger, Anthony Young. On 10th July 2012 Yates had been given a six months conditional discharge for his first offence or producing cannabis, she added. Joe Maloney, defending, told the court “This is a man who is very, very ill indeed. The only thing he has found which ameliorates his pain is cannabis. “He has been prescribed morphine in the past but it has caused him all sorts of difficulties. Pain relief is all he is interested in and for that cannabis seems to assist him. “This is a man who is terminally ill, who is in considerable discomfort and pain. He obtained cannabis seeds which were given to him by his sister so he could aid his suffering himself without having to rely on drugs dealers and the illicit drug market. Passing sentence Judge Hart told Yates “You have been suffering for some time now with a very serious cancer and you have undergone treatment which has been, I am sure, very unpleasant and very distressing. The prognosis for you is bleak. “You find some comfort in the consumption of cannabis. You drink whisky and you also find comfort in that. The pain relief provided by doctors does not provide you with what you need. The judge ordered destruction of the cannabis and all Yates’ drug growing paraphernalia – but allowed him to keep the box in which the equipment was kept after Yates said it has great sentimental value because it belonged to his father who died when he was two and a half. After the hearing Mr Yates said he would have been ashamed if he had been jailed because he would have felt he was letting down his 20 year old university student daughter, who has been a great support to him. He also has a son aged 39. He said his radiation treatment in 2011 had reduced the tumour so that he is now in remission but it had left him without a sense of taste or smell and without the ability to produce saliva. He constantly has to drink water and use an artificial saliva spray. Neither is he able to chew or swallow food and is fed through a tube directly into his stomach. It is the pain in his throat at the base of his tongue that a nightly smoke of 3-4 joints of cannabis relieves so effectively he said.